The winner will be selected at random from all entries on Wednesday, December 5th. 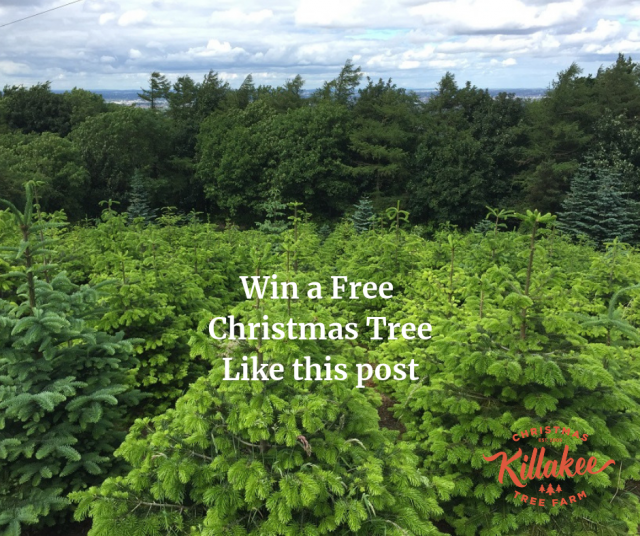 The lucky winner will come to the Killakee Christmas Tree Farm and pick their perfect Christmas Tree (up to 8 foot) from our huge selection of trees growing on the Christmas Tree Farm or from our selection of pre-cut trees – the choice is yours. Make sure you’ll be able to collect the Christmas Tree from our farm. Don’t forget to tell your friends! Enter now to be in with a chance to win your perfect Christmas Tree. Winner must be able to collect Christmas Tree at Killakee Christmas Tree Farm before December 22nd 2018. No delivery. This offer runs from 26th November 2018 – 5th December 2018. Winner will be selected at random from All likes received on Killakee Christmas Tree Farm’s Facebook and Instagram pages during the offer period on December 5th 2018. The winner can choose a Christmas tree up to 8 foot from the selection available at Killakee Christmas Tree Farm. Killakee Christmas Tree Farm, Killakee Road, Rathfarnham, Dublin 16 is the promoter of this offer.